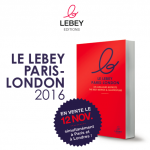 Lebey editions have launched the first restaurant guide to review the best bistros and gastropubs in the two major European capital cities, Paris and London, in a bilingual French and English edition. With a strong emphasis on good meat, this guide reviews more than 200 addresses to enjoy traditional food and creative cuisine. The Lebey Paris-London is for Parisians who work in London, for Londoners who work in Paris, for tourists and for all the food lovers in Paris and London. The Lebey ethical code has been respected, as usual: all venues have been inspected at least once a year by incognito food critics, who pay for their meals.